I loved this book. I learned so much about not only Michelle Obama, but about life as a black female in a white, male dominated world. I also learned so much about Barrack Obama and what it was like being the president. All this was done without being preachy. She simply shared her life, her dreams, her trials and tribulations and ideas from her heart. With the cost of the presidency, it was refreshing to hear that the Obama’s paid their own decorating costs (they are allowed to spend up to $100,000.00) or that they covered the cost of family guests). Michelle felt guilty whenever they had to spend for security details when they just wanted to be a family or couple. Being in the spotlight where everything you say or do could end up on the news and fodder for the critics proved to be one of the major issues for her. Another thing that touched me was hearing about the trials and tribulations of being the children in the First Family. Things we took for granted growing up, were not easy for the Obama’s. The narration was wonderful and I felt like we were sitting and talking. This was an excellent memoir and I definitely recommend this one to everyone. I also have to thank Kimberly at Caffeinated Reviewer for the one month Audible Subscription for winning the draw after completing the Ho Ho Ho Readathon. This was my freebie for the month. 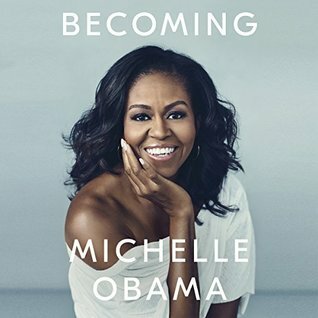 About the Book: An intimate, powerful, and inspiring memoir by the former First Lady of the United States. I can’t wait to listen to this book! Wonderful review, Carla. Thanks Jonetta. I hope you enjoy it as much as I did. I would definitely recommend the audio, but I will warn you, it is long, but well worth the time to hear her story. Thanks Hayley. I hope you enjoy it as much as I did. What a wonderful review, Carla! I’m pretty sure I’m going to be on my library’s hold list for the next 5 years waiting for this, but I suspect it will be worth the wait. Did she narrate herself? If so, I’ll probably seek out the audio instead! Thanks Myndi. Yes, she narrated and it was like you were sitting with her. I can send this book to one person. Not sure what the specifics are to do this, but are you interested? Oh, yes! I’m definitely interested!!! Great review! I loved this book too! She is such an inspiration. She sure is. Her inner strength is amazing. Glad you enjoyed this one as well. It really was. All females will get somrthing from this book, but do will men. Good review, Carla! This has been on my wish list since it came out. I’m eager to read it. I hope you get the chance and that you enjoy it as much as I did. It is appearing at libraries now, so you could always try to get a copy there. Uh, libraries at my place don’t stock new releases. 🙂 I’m from India. Oh right, I heard that from Shalini before. That is too bad.